I just saw in the news a short coverage of an Vatican meeting where the Pope came by car that was addorned with two flags that were sometimes reported as Pope's personal flag. There were of the same design as the state flag of Vatican, but the Vatican Coat of Arms being replaced with the papal personal Coat of Arms (blue, golden cross and letter M) of Pope John Paul II. Even if these flags are somtimes (rather often?) seen in various occasions, I think that this is first time I have seen them used by the Pope himself or the Vatican government - otherwise these flags were always seen (more or less) as ornamentation hoisted by Catholics in various occasions. The two flags on the car were rather in the triangualr pennant form, with the white fields therefore being considerably larger then the yellow field, so that it could contain the CoA confortably. The square, yellow-white "flag" with John Paul's arms which appears on the is more difficult for me to address. I left Rome in 1994 and have never seen it. I assume that you have seen it used as a "car flag," which is not out of the question. Again, I doubt there are legal directives in its regard. I am confident, however, that it would never be displayed from any Vatican buildings as a full-size flag in any official capacity. The pope uses several different motor vehicles, which display either the regular Vatican flag, or a special pennant. For John Paul, the pennant is correctly pictured here: yellow-white with the papal arms on the white stripe. For Paul VI, it was yellow-white with the papal arms in the middle. To my knowledge there are no official directives specifying the exact design of the pennant. I suspect its precise design is a matter of tasteful liberty for the attendants of the papal household. Because, however, it appears on the pope's own vehicles, I would call it "semi-official." Nor do there seem to be directives concerning when the pennant is used on motor vehicles, as opposed to the regular Vatican flag. I suspect that the custodian of the vehicle who is on duty for the occasion simply decides by himself which banner to affix to the car. In recent years it usually seems to be the pennant; but sometimes it has been the regular Vatican flag (e.g., when the pope was shot in 1981). The yellow-white pennant used on motor vehicles carrying John Paul II bears his personal Coat of Arms on the white stripe (i.e., his personal shield-of-arms supported by the tiara-keys emblem), not the simplified tiara-keys emblem. At <www.nytimes.com> there is a picture from a new TV movie about the late Pope John Paul II. Behind Jon Voight (as the Pope) is a flag being waved by a spectator that places the Pope's own arms in the center (perhaps slightly to the fly) of a horizontal white over yellow flag. It may be a TV mistake, or maybe it was a real-life one that was copied. Much more likely is that the flags held by the supporting artistes are deliberately made to look very similar to, but slightly different from, the official flags. Such a practice is very common in the film and television industry when making props. See also the following John Paul II hand flag variant photographs (here and here) taken in Rynek Glowny, Kraków, on the day of his funeral, 8 April 2005. Kraków is the city where the late Pope went to University and was Archbishop from 1964. There were extensive tributes to the late Holy Father in virtually every business window in the city centre and floral tributes in public spaces in the city, many of which also incorporated small flags. These flags were also carried by the many thousands of people attending an open air Mass at Blonia Common, where television coverage of his funeral was being relayed. I did not witness any flags such as those in the photograph of Jon Voight, from the New York Times web site, but there were undefaced horizontal white over yellow bicolours. John-Paul II has a blue shield with golden cross off-centered towards dexter chief, with a golden 'M' in sinister base field. The 'M' stands for Mary, Mr. Woyti³a's personal devotion. Above the shield there is a papal tiara (three times crowned hat), and behind shield are crossed golden and silver keys. The image was made from a promo material from the 1978 papal visit to Portugal: I recolored from a b/w Petra Santa large sized image. Note that the cord should be red, also all of the gems in the tiara. The ribbon emerging from the tiara will be red, too, with golden crosses and golden fringes. A pretty good source for symbols of the Catholic church might be named: Peter Bander van Duren (ed. ): Armorial Bruno B. Heim [hei81], Van Duren, Gerrards Cross, England, 1981. In effect, the Arms of HH JOHN PAUL II are not only famous but singular into Papal Armorial. The Azure (blue) field charged with a dextered flat cross accompanied by a "M" on sinister canton of the base was initially on Sable (black), which is explained because on German School and those that are subject to their influence (the Polish one, for example) seems not to have the same rigor with respect to the application of the classic heraldic parameters and into this specific case, we can note an evident lack to the Tinctures' Canon (Saber on Azure, color on color). When His Eminence Cardinal Wojtyla was enthroned Pope, Monsignor Bruno Bernard Haim (Great Heraldist and In-Charge of Vatican Armorial) suggest to replace Sable by Or (yellow). Now, the Cardinal enthroned Pope maintains his Arms but naturally changing its external ornaments, replacing the red cap as crest which two games of tassels at flanks more another attributes that corresponds with the Cardinal dignity with the Tiara (closed mitre with ovoid form and three crowns, everything in Gold) over the Chief and the two crossed keys (one of Gold and another one of Silver) disposed behind the field in saltire and rolled by cord in Gules (red). Once takes place the outcome that lamentably is imminent [i.e., the death of Pope John Paul II], the Arms of HH John Paul II will mantains the Tiara but will omit the keys, since these symbolize the government of the Church as much Sovereing State as Religious Institution, alluding naturally to the "keys of the Kingdom of the Heaven" that Our Lord Jesus Christ gave to Saint Peter constituing him First Pope. Meanwhile "Vacant Seat" takes place (transition between the decease of a Pope and election of its successor) the Church Government was in charge of Cardinal School and all the Eclesiastic Hierarchy; nevertheless, to the State effects, is assumed by to so called "Camarlenge Cardinal" who during the exercise of his functions will may use as Ensign of his dignity the Papal Umbrella: it's in effect, an umbrella enameled in Or and Gules and singularly ornamented. I saw a documentary on television a few days ago. As incredible as it might sound, the late Pope John Paul II did not seem to have a coat-of-arms when he was a Cardinal. When he became Pope, he had to have a coat-of-arms, and he proposed a blue shield with a golden cross (for Jesus Christ) and a golden letter "M" (for the Blessed Virgin Mary). His advisor told him that heraldically it does not make sense to put a letter on a shield. The Pope, whose Polish Catholic tradition stresses devotion to the Blessed Virgin Mary, replied that it does not make sense for him not to put the letter "M" onto the shield! That's why Pope John Paul II's coat-of-arms had letter "M" on the shield, contrary to standard heraldic practice. According to Rev Guy Selvester, who is something of an expert on ecclesiastical heraldry, this is not quite correct. As Archbishop of Cracow, Karol Woyti³a used a shield similar to the one he used as Pope, but with the charges black on blue rather than gold on blue. The Vatican heraldic expert Archbishop Bruno Heim was able to persuade him to alter the colors to the more heraldically correct gold on blue, but not to change the design. Exactly so. Moreover the presence of the letter 'M' is not unheraldic at all (the most you can say is, that it is unheraldic in a number of countries) and remember that John Paul II did not adopt the traditional Italian 'horsehead' shield. At <www.sca.org> it is suggested that "enhanced to sinister chief" should be the blazon of the off-center cross. If blazoned this way at all, it is "enhanced to dexter chief," and if enhanced one doesn't have to specify "chief.". My heraldic colleague Fr. Guy Selvester suggests "a Latin cross throughout skewed to dexter." The ecclesiastical heraldry page of the website of the Italian Heraldic-Genealogical Institute gives "D'azzurro alla croce d'oro, il montante posto verso destra e la traversa alzata, accompagnata nel canton sinistro della punta da una "M" dello stesso." I think the corresponding English blazon would be "Azure a cross or, the upright placed to dexter and the crossbar enhanced, in sinister base an M of the same." 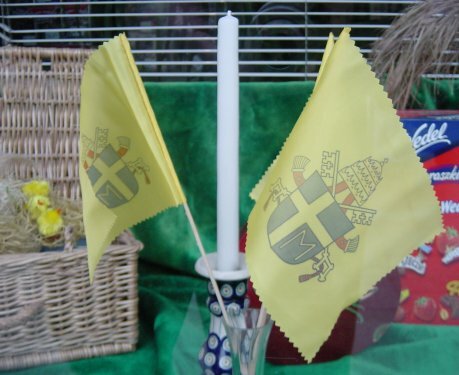 Here is a reconstruction of the "gonfalone", or standard used in Saint Peter's Square, during the proclamation of the new pope Benedict XVI. The arms thereon are those of John Paul II. According to <www.rian.ru> during statement of HH Pope Benedict XVI in front of people which have gathered on the square, right after his elections on a loggia of a cathedral of St. Peter, it has been still hung out cloth with the image of the coat of arms of HH Pope John Paul II. It's amazing how many people assume those are just the Papal arms. Since the death of John Paul II, CBC News (at least, but that's the only news I've watched lately) has used John Paul II's arms as a small "icon" on the screen whenever Pope-related stories come on, news about his funeral, about the College of Cardinals voting, and even, strangely (to me), at the announcement of a new one! The coat of arms showed on the occasion of the presentation of the new pope is similar to the coat of arms of John Paul II, but it is not the same - the cross and M are there white (argent) unlike in J.P.II's where they were golden (or). Such difference makes it a new coat of arms entirely. Moreover, the thing hunging from the balcony is not a flag nor a gonfanon nor anything of vexillologic primary interest. The thing is rather a carpet or a tapestry, as was clearly visible while they were installing it there. I thought the same thing the first time I saw the picture, but if you compare the cross and M with other white/silver areas of the tapestry (the silver areas of the tiara and the silver key), it's clear that they are not the same. I think the yellow/gold on the shield is just very light, possibly from fading, possibly a function of blue filters on the camera, or whatever - but nevertheless not white. I'm sure that Joe McMillan's explanation must be the correct one. Note the image of John Paul II's arms at <www.catholic.org>. While the charges are clearly Or they are also clearly a much lighter shade of gold than the frame around the shield. 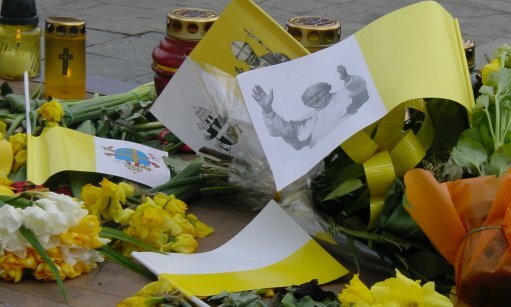 In a photo at <www.paulines.ph> from the beatification ceremonies of Father Giacomo Alberione, 27 Apr 2003, you can see that the charges on the papal arms do appear argent, even back then. It is probably just an illusion caused by the lighting and contrast with the darker shade of the frame around the shield.